Thailand has countless beautiful islands and beaches and many of those are frequented by Western tourists. If you’re looking for the beach life, but don’t want to visit a place that’s packed full of sometimes rowdy visitors, head instead to Prachuap Khiri Khan. This coastal town in Central Thailand is frequented by Thai tourists, with thousands of them traveling down from Bangkok to stay in second homes for their vacations. The beaches are gorgeous, and the atmosphere is quieter and more refined, plus there are ample other things to do too, such as visiting nearby national parks, playing golf, shopping, spas and more. If we’ve caught your attention with that introduction, you’re going to want to know how to get from Bangkok to Prachuap Khiri Khan. The good news is that it’s not too far to travel from the capital city. By road it’s a little under 300 kilometers (about 185 miles), and as well as the usual road options of buses, vans, and taxis, you can also get to Prachuap Khiri Khan by train. The even better news is that it’s incredibly affordable to travel this route, especially if you go by van, and with no ferries or changes to worry about, the trip is also nice and easy! We’ll start with the cheapest option for travel to Prachuap Khiri Khan from Bangkok, and that’s by van. 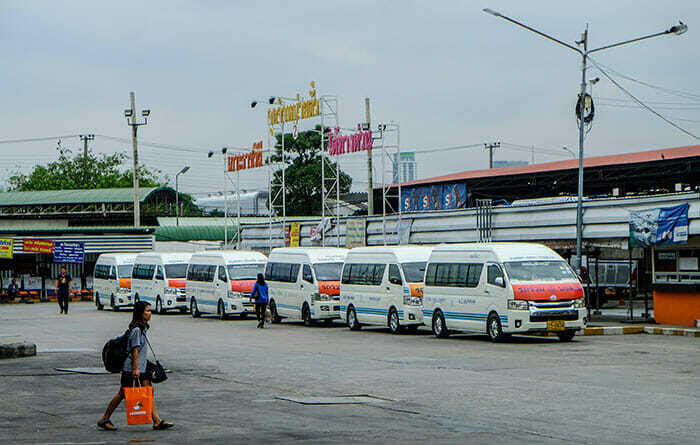 Call it a van or minibus, they are incredibly affordable and depart from Sai Tai Mai Southern Bus Terminal in Bangkok, and are operated by Malee Van. There are eight departures per day, spread out across the day from 06:00 until the last departure at 17:30, and the journey takes around 4.5 hours. Being a van/minibus, you’re basically buying a seat and nothing else, except you do get air conditioning, but, compared to some journeys in Thailand, this one is relatively short, so for the bargain price you probably wouldn’t care! One thing to be aware of with the vans and buses is that they do not drop you right in the center of Prachuap Khiri Khan, but about 3 kilometers (1.8 miles) outside the center, on the highway. This can be very inconvenient if you’re arriving late at night but at most times you should be able to get a tuk-tuk or motorbike to take you into town, especially from the 7-Eleven store. Similar to the vans, buses are a very affordable way to travel from Bangkok to Prachuap Khiri Khan, and cost just a little more. 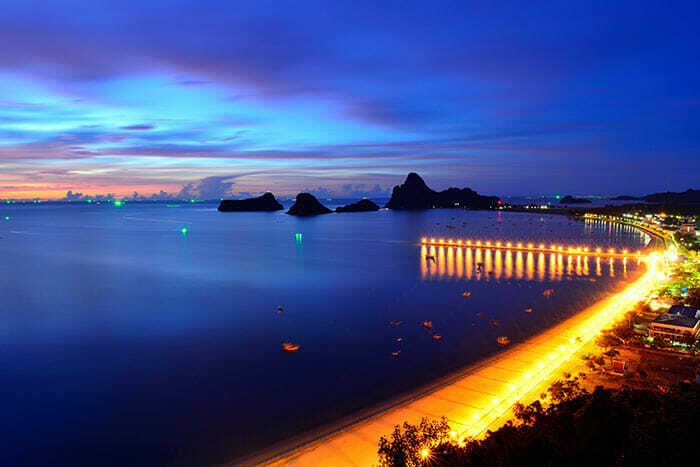 Tour company, Bang Saphan, operates this route, departing from the Southern Terminal in Bangkok, and arriving (as mentioned above) on the outskirts of Prachuap Khiri Khan. There are numerous departures throughout the day, starting as early as 07:30, with the last one leaving Bangkok at midnight. Be aware that the advertised scheduled travel time is 3 hours, however, it will take longer than this, even with light traffic, so bear this in mind if you’re planning onward travel and allow yourself several hours extra, to be on the safe side. The buses are all Express service, so they have air conditioning as well as snacks and a steward, plus there are washrooms onboard. Taking the train from Bangkok to Prachuap Khiri Khan is a good choice if you like to have a little extra space to spread out in. The train does cost more than the bus, but is still a reasonably priced option. 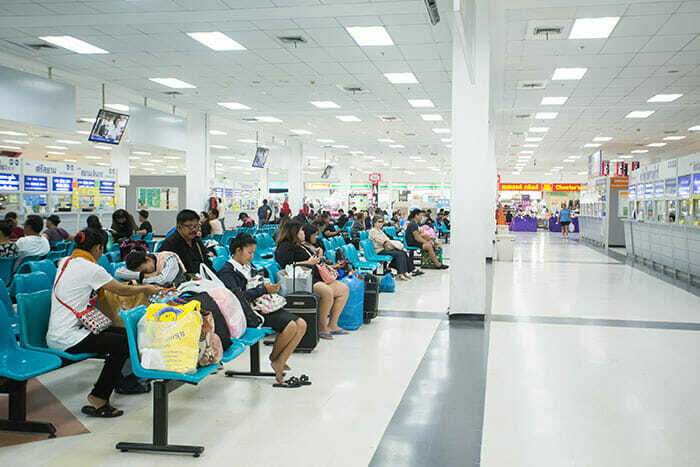 Thai Railways actually has two routes that serve Prachuap Khiri Khan, the main one departs from Hua Lamphong Station, plus there is a second service from Thon Buri. 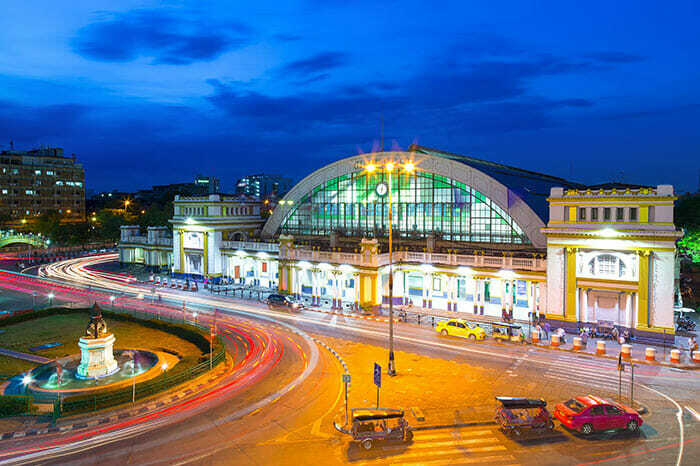 Four trains depart from Hua Lamphong, so you’ll have a better choice of cabins if you go from here. Departures are at 13:00, 17:35, 18:30, and 19:30, and even though none of these trains travel overnight, there are sleeper cabins available, so you can sit back and relax in relative comfort. The scheduled travel time is between 5 hours 25 minutes, and 5 hours 45 minutes. The benefit of the train over the buses and vans is that it arrives in central Prachuap Khiri Khan, making it easier to get to a hotel or other place without having to worry about catching a tuk-tuk. The final option for travel from Bangkok to Prachuap Khiri Khan is also the most expensive: taxi. 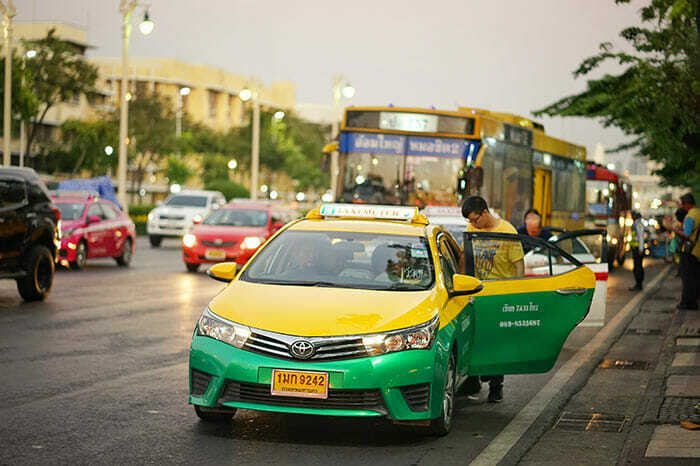 Two taxi companies provide services between these two cities, BangkokTaxi24 and Thailand Limo by Datum. Prices are quite comparable between these two, so which one you choose may come down to personal preference over the cars they are operating, or their availability. For example, you could get a comfort sized sedan, an SUV, or for something larger there are 7-seater minivans, and 8 and 9-seater vans. Obviously, the larger the vehicle, the more you will pay but this also means that you can fit more passengers in and split the cost between you – a great idea if you’re traveling with a group of friends, or with your family. Some of these vehicles even go so far as to provide wifi and TV onboard if you want a high-class service. The other great advantage with a private taxi over any of the other travel options from Bangkok to Prachuap Khiri Khan, is that it’s a door-to-door service. The taxi will collect you from your hotel in Bangkok, and drive you all the way to your hotel (or wherever else you want to be) in Prachuap Khiri Khan. So, it costs more but it’s great for convenience!